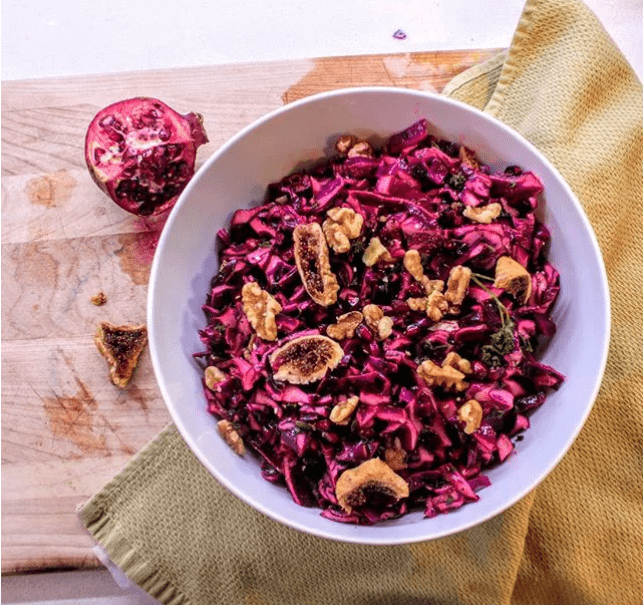 This bright pink cabbage salad is packed with antioxidants, flavour and bright colours to boost your mood and nutrition! There is a slight sweetness from the figs and pomegranate, and a lovely earthiness from the cabbage. High in fibre and liver-boosting nutrients, this salad is a perfect addition to any meal. Bring it to a holiday party or potluck to add some brightness and healthy food to the table! Mix all ingredients in a large bowl and set in the fridge. This will taste best if you let it sit in the fridge for a couple hours… Otherwise it is just as good with crispier cabbage. Enjoy!